Melton RFC First XV put aside their league troubles for one weekend as they booked a place in the County Senior Cup semi-finals on Saturday. The Firsts completed an excellent 29-17 win at Burton Road against a very good Loughborough side who they could well face next season when they drop down to Midlands Two. The two sides played out a rollercoaster of a contest in horrendous conditions as galeforce wind played havoc with both kicking and handling over any distance. In the end the result came down to sheer willpower of a determined home side who continue to improve with every game. The hosts started well and nudged into the lead with a great team try, finished by the outstanding Jake Dixon out wide, making the conversion impossible into the wind. Loughborough hit back and within five minutes of sustained pressure had bludgeoned their way over for a try to level the scores. As the wind increased, half-backs Chris Rose and Archie Hutchinson played a much tighter game, and with Leon Gormley and Ollie Circuit cutting into the Loughborough midfield, Melton withstood the waves of attacks. Rose’s lovely kick ahead saw Harry Cank give chase and he managed to charge down the full-back’s attempted clearance kick. With the ball bouncing kindly he outpaced the rest of the defence and scored under the posts for a game-changing try. Rose converted to put Melton 12-5 up, and they held the lead until half-time. By this time Melton had lost Jordan Pawley to a rib injury, but were able to call on the evergreen Dave Osborne at loose head who played as if he’d never been away. Loughborough rang the changes for the second half and a harsh penalty against Melton saw them score from a catch and drive, again out wide with no conversion possible. The home side then produced some of their best rugby of the season as Pete Clarke, James Long and the ever-improving Luke Pawley carried the hard yards, ably assisted by Duncan Lennox and Sam Dennison. After several strong runs, Pawley was denied a try as the referee was unsighted, but Melton came away with the points following a morale-boosting pushover score, with Dennison touching down. Melton should have seen out the match with 10 minutes left, but to Loughborough’s credit they scored a try out wide and then landed a difficult conversion from the touchline to tie the scores at 17-17. With wins so rare this season, many teams would have crumbled in extra time, but not Melton. Energised by head coach Gareth Collins, Aiden Smith and the irrepressible James Cavanah, it was all Melton, with Jake Dixon scoring his second try in the opening 10 minutes. Collins then gathered his brilliant chip and chase to score under the posts and Rose easily converted to seal Melton’s passage to the last four. 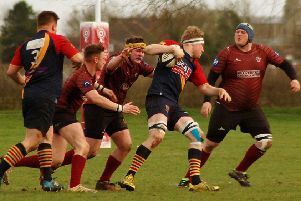 On Saturday, Melton return to Midlands One East league action away to promotion-chasing Oundle.